So I'm going to be reviewing the movie and book sort of together, because they are pretty much the same thing. The documentary took four of the girls from the book and followed them around during their treatments and such in Renfrew. I'm not sure how I feel about Renfrew. I mean it seems okay at times, but having never been to a facility like that, I don't really have much to compare it to. The therapist Adam seemed like the best person in that whole place. He was one of the few who seemed to really care about the women and whether or not they got better. The thing I enjoyed most about the book versus the movie was the variety of women and ages. I feel like the girls in the movie, were all practically the same, whereas the book had much older and young women in it as well as an over eater. One thing that seemed strange to me about Renfrew was the overweight staff. Some of the nurses and such were quite fat. It seems like that would scare the girls more than it would help them. You're supposed to show them a healthy alternative to what they are currently at. I think that when they see these overweight women it would just make them feel even more uncomfortable about eating and gaining weight. The photographs were amazing, some were completely breathtaking in their raw intensity and truth. Here's a tamer example of the photographs inside. That's the same girl. On the left is when she first arrived and the right is ten months later. It's crazy to think of how small some of these women came in at. Under 80 pounds some of them! 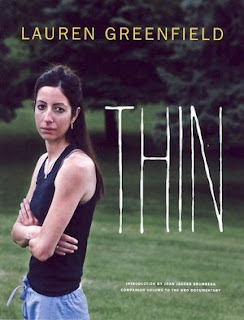 I've always been fascinated with eating disorders. There is such a stigma around them. Many people don't believe it's an actual disease. I think very often it is. It's usually not the only problem either. I think the documentary and book both showcased the disease in a different light. It showed the struggle each of the girls face, not only in treatment but afterwards too. These are very eyeopening and I hope many people will look at and watch Thin. It is powerful and honest. "Every girl is affected by the desire to be thin." "I feel like I shouldn't even have this disorder. There are people here who have been sexually abused and come from parents who are just horrible. I had a wonderful childhood."